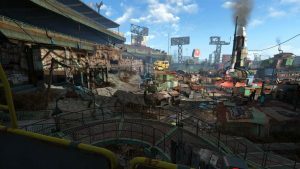 November 7, 2287 – Nick and I left his office in Diamond City and headed out past home plate toward the abandoned West Stands, where we hoped to find more about this mercenary, Kellogg, and the young boy that traveled with him. Based on the description I had given, Nick suspected this was the man who had killed my wife and took Shaun. If it turned out to be true, there was a pretty good possibility that the kid was Shaun himself. I suddenly realized that yesterday had been two weeks since I had emerged from Vault 111. If Nick and Ellie’s description of Kellogg’s kid was accurate, and if it really was Shaun, he would have been out here for maybe up to ten years. That’s such a long time when you’re a kid. I remembered summers seeming like they lasted forever, followed by bitter cold winters that seemed to drag on and on until the snow melted and the warmth and color returned to the Commonwealth once again. On the one hand, I was grateful that there was a possibility that he was OK – still alive, and who better to protect him than a mercenary. On the other hand, Nick mentioned on our way up to Kellogg’s last known residence that the guy was bad news. He was more than just a mercenary, he was a professional. Didn’t have any enemies, because they were all dead. So not only had I been robbed of watching Shaun grow up, watching him become a person, not only had Nora and I missed all the memories and precious moments we once thought we’d have as a family, but there was a very real possibility that Shaun might be more different at this age than I could ever have imagined. What kinds of horrible things might he have witnessed in the company of this “Kellogg?” Would he be hardened? Ruthless? I had seen kids in the war that could do unspeakable things – child warriors trained just to stay alive and to kill. 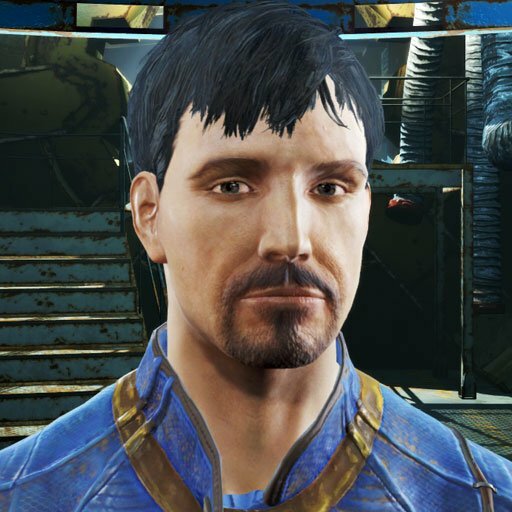 Would Shaun even know where he had come from — that he had a dad who was out there, searching the Commonwealth for him? That he had a mom who had loved him so dearly. My train of thought was interrupted by our arrival at Kellogg’s place. Nick was trying to get the lock to the front door open, but wasn’t successful. He told me to give it a shot, but my head was buzzing with all these thoughts, and I couldn’t concentrate. The lack of sleep wasn’t helping. I hadn’t so much as closed my eyes since waking up in Trinity Church, and a lot had gone down since then. I fumbled at the tumblers for a couple minutes, snapping several lockpicks in the process, and cursed in frustration. Nick offered that maybe I should go see the mayor about the possibility of getting a key, and directed me to what looked like a window washers’ platform a hundred or so yards away that led right up to McDonough’s office. I figured it was worth a shot, so I made my way around the crumbling bleachers, eventually entered the rickety carriage on the platform, and hit the big button that started the winch. It was a crude way to get up to the mayor’s office, but I guess just like everything else in Diamond City, folks got by with whatever they could scrounge up, and the mayor was apparently no exception. When I got to the top, I was surprised to see Piper arguing with McDonough’s secretary. Well, I say arguing, but she actually seemed to be threatening her, talking about potentially exposing some affair the mayor was having. 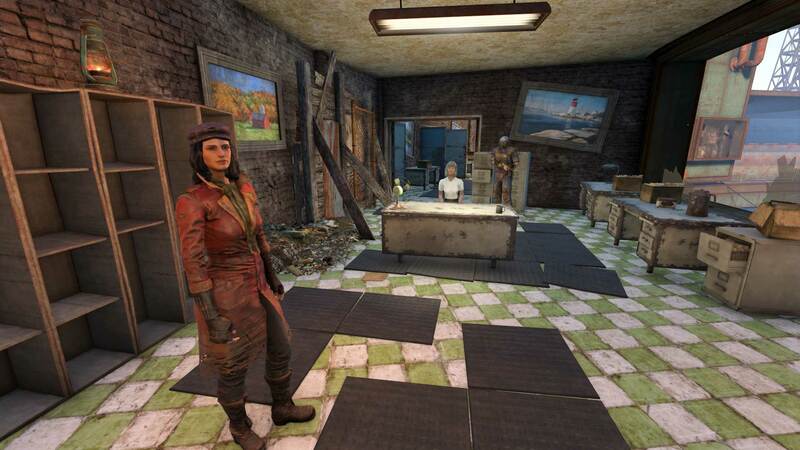 Piper wanted to know why McDonough was meeting with some suspicious looking carrier every couple weeks who would sneak in and out of Diamond City before anyone got a chance to talk with him. The courier wasn’t from any of the traveling caravans, and no one seemed to know who he was. This was going to be the topic of Piper’s next big article for Publick Occurrences. She told me to be careful, and headed out. I couldn’t help but think perhaps she should take her own advice. It sounded like she was stirring things up that perhaps would best be left unstirred, at least until she managed to find out who this courier was. I’m sure she had other ways of discovering this information, and I wasn’t clear why she needed to go right to the mayor over it. In any case, when I asked McDonough’s secretary about Kellogg’s house, I was informed that the mayor’s office had foreclosed on the property after Kellogg had left town, and if I had any claim on anything inside, I was free to make my case to McDonough to have the place opened up. 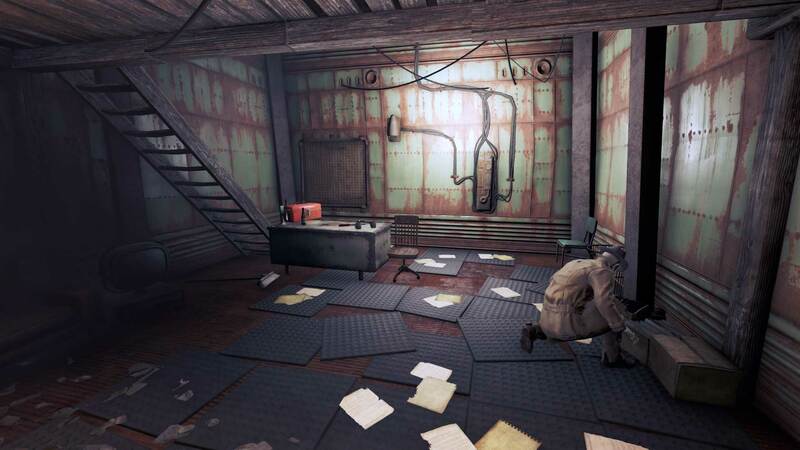 With that, he handed me the key to Kellogg’s place, said he was busy and needed to get back to work, and again reiterated that Kellogg was probably long gone and that I wasn’t likely to find him. Ten minutes later, Nick and I were in Kellogg’s house. 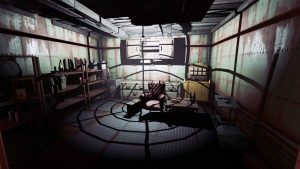 The place was dark and cramped, made of the same metal sheets that just about everything else in Diamond City was made of. The lower floor of the house contained a metal desk, a couple chairs, a toolbox, a TV and a table. Papers and other debris on the floor gave the impression that the place had been tossed and emptied, like there had been far more stuff in here at one point, and these sparse furnishings were all that remained. Above us, up a narrow wooden staircase, was a loft with a bed, but nothing else of note. As I came back down the stairs, I noticed a wire taped to the side of the desk. It led underneath to a button which opened a panel in the wall by the exit. Bingo. On the other side of the panel was another small room which looked like a workspace. It was dimly lit with one bulb handing from the ceiling, and contained a comfy chair, quite a bit of ammo, a couple bottles of Nuka Cola Quantum and Nuka Cherry, some cigars and alcohol, and a duffel bag with more ammo and a heavily modified pipe pistol. A set of shelves on the far wall held boxes of dried food and purified water. It was almost like a bomb shelter or a safe room. Whoever had tossed the main part of the house obviously hadn’t found this space, and I kept looking behind me through the panel opening into the main part of the house, half expecting Kellogg himself to appear. But as we scoured the room for more clues, all was quiet until I asked what our next move was. Nick examined one of the half-smoked cigars sitting in an ashtray next to the comfy chair, and noted, “if only we had a dog.” Turns out, I knew just the dog for the job. The only problem was, he was all the way back with the Minutemen at Red Rocket and Sanctuary Hills. The trek up through Cambridge, Lexington and Concord would take up the better part of the afternoon, even if we didn’t run into trouble, and I desperately needed to rest, even for a short time. Nick suggested he could bring back Dogmeat and I could check in at the Dugout Inn for a few hours until he got back. I considered it for a moment, but then realized it was probably safe to say none of the settlers nor the Minutemen up past Concord had ever seen something like Nick, and I wasn’t sure he’d make it out alive, let alone be able to convince them to take Dogmeat back to Diamond City with him. He said not to worry, that we didn’t know each other very well, but I could trust his negotiating skills. This wouldn’t even be a challenge for him. I told him if there was any trouble, to ask for Mama Murphy, that she was more likely than any of them to convince the others. I told him to mention Lily June on the Rocks to Mama if they needed convincing that I had sent for Dogmeat. And with that, Nick and I parted ways. He to go pick up Dogmeat, and I to get a few hours shut eye before we started tracking Kellogg.